Difference between mobile app and mobile website. Lots of people still do not understand the basic difference between a mobile app and mobile websites. So to overcome this knowledge below are the very basic difference between mobile app and mobile websites. These may be considered as qualities of mobile app and mobile websites. (1) Mobile apps are accessed after installing and mobile website are accessed through browsing. (2) The pure mobile app will have an interactive user interface whereas mobile websites will have a static navigational user interface. (3) Our mobile apps are available offline whereas mobile website requires internet connection. (4) The pure mobile app can make use of mobile features like camera, location services and more but mobile websites have somewhat limited features. But what is better for business and traffic A mobile app or mobile website. 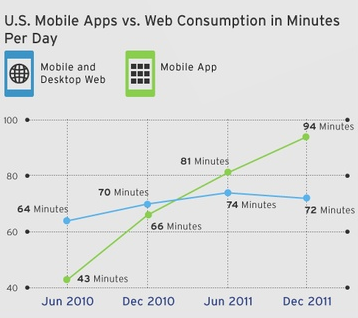 Below is a research carried out in America which shows consumption in minute per day of mobile app and mobile websites. 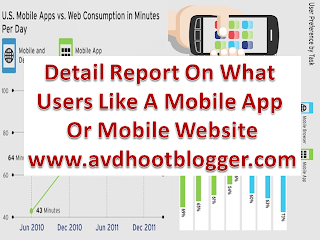 What is accessed by people in more numbers a mobile app or mobile website. The blue color shows the consumption of mobile websites and green color shows consumption of mobile app. As you can see from graph mobile apps are used more than the mobile websites. Users prefer to mobile apps than the mobile websites. There is single drawback which I think the most affects to users and they prefer mobile apps than the mobile websites is an internet connection. In India 70% users have an internet connection in their mobile but what about those 30% which have the Smartphone but not internet connection they will use mobile apps. So this is the advantage of making mobile apps for websites and gain traffic and popularity. Mobile apps are made for Building brands and promoting them. So it is a great way to promote your website as a brand. So in this case mobile apps have left mobile website behind. 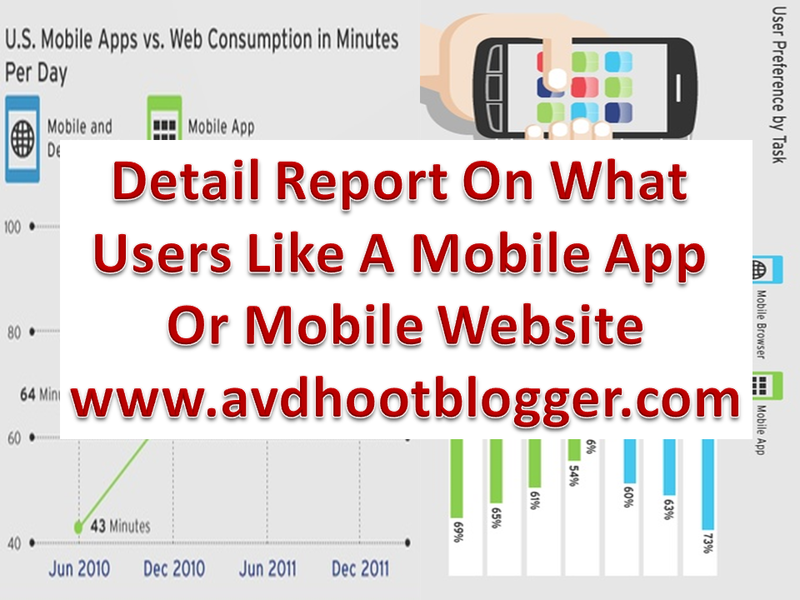 User prefers mobile apps and mobile websites for different - different tasks. Now below is one more interesting study that reveals that not all the users are preferring mobile apps than the mobile websites. But according to the task that choose what to prefer a mobile app or mobile website. In which category users use mobile websites. For online shopping users prefer mobile websites . For searching data and information users prefer mobile websites. For entertainment purpose like celebrity gossip and other similar stuff users prefers mobile websites. In which category users use mobile apps. For connectivity users prefer mobile apps. For navigation purposes users prefer mobile apps like google map. For information and latest updates users prefer mobile apps like an rss feed. To manage people and for social bookmarking people prefer mobile apps. So where to focus on mobile apps or mobile websites. Well the result is in front of you. According to the data it depends on the type of data you have. If you have an online shopping website then you do not have to worry about mobile apps because people use website optimized for mobile devices and if you have such navigational website than better to create a mobile app. So it depends on the type of content. Finally both the results are in front of you and there is no result. Both have their own importance. So it is up to you what to choose between a mobile app or mobile website. Description : What is better a mobile app or mobile website. Revealing research and studies so that you can better promote your content and drive traffic to your website.